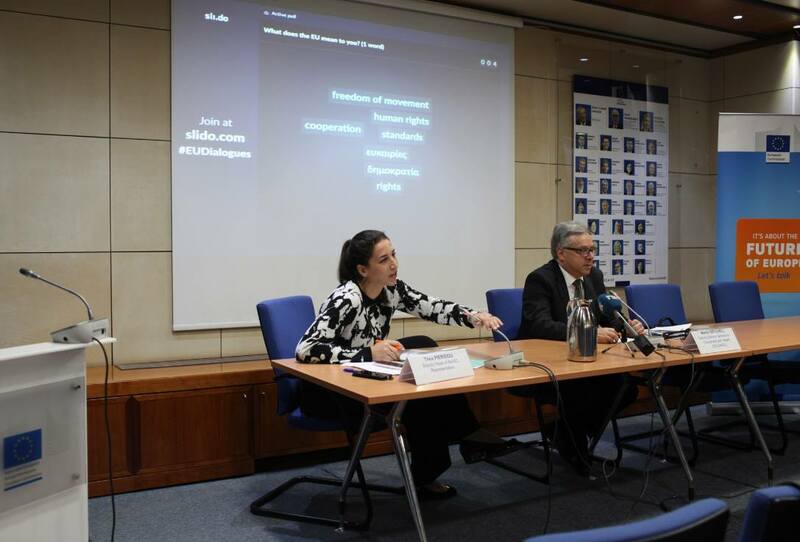 On Friday 5 April, the EC Rep organised a Citizens' Dialogue at the EU House with Mr Martin Seychell , Deputy Director General responsible for Health. The dialogue focused extensively on the challenges that the EU is facing in its effort to improve the problems in the health sector and ways to deal with these challenges and problems. The lively discussion with the citizens also focused around the importance of the prevention and early detection, cross-border implications and the need for collective action to develop structures for the prevention of serious and rare diseases. "If we detect people at a very early stage, we already know for many types of cancers that the likelihood of recovery is very good," Mr Seychell stated. Participants were also interested to hear how the EU is supporting Cyprus and can further support Cyprus within the European Semester process with more investment in the field of Health. Stressing the importance of the dialogue, Mr Seychell noted that this is a very important time as the EU needs to see what "we should do more, better, differently, and this is also one of the reasons I am here because I want to listen from you, what you think we should do differently."